Bethenny Frankel (right) appeared with Ellen DeGeneres Oct. 14 during a concert for disaster relief in LA. 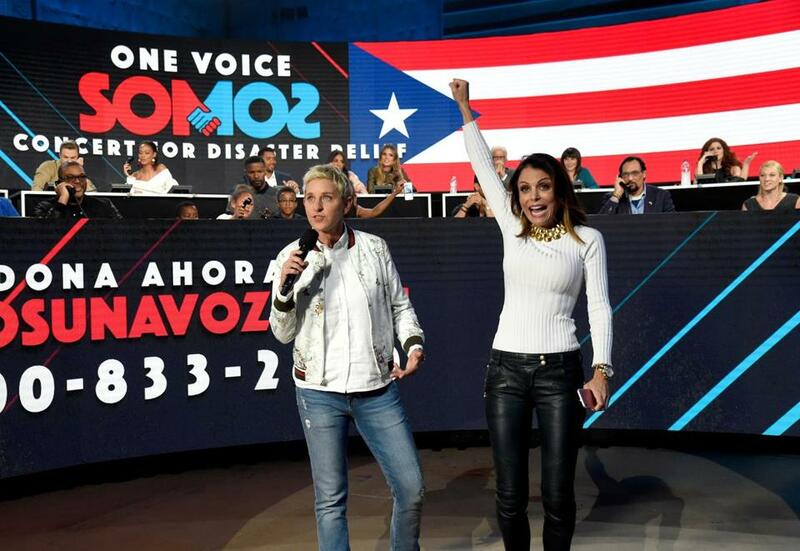 In the days after Hurricane Maria, many celebrities contributed time and money to people in need. Bethenny Frankel, star of the “Real Housewives of New York City,” wanted to do her part, too, but she felt the need to be there in person. She’d just been to Mexico to assess the damage caused by the earthquake, and then, within a week, she’d chartered four planes with supplies for Puerto Rico. She was on the ground, assessing the devastation, making lists of what she could bring to the territory. “Paying my own way for Puerto Rico. Filling this B up w supplies,” she said on social media, with a picture of a private plane and a link to where fans could donate (www.bstrongdeliveringgood.org/bstrong/). Frankel — who not only rules “Real Housewives” but also created the SkinnyGirl cocktail and food empire — will talk about her relief efforts, among other topics, when she appears at the Massachusetts Conference for Women on its opening night, Dec. 6. To bring some attention to the event — which will also feature Boston celebrity chef and memoirist Barbara Lynch — Frankel called to chat with the Globe about her continuing work in Puerto Rico, her tips for multitaskers, and why she doesn’t talk Trump (despite having been on the Donald Trump-produced spinoff “The Apprentice: Martha Stewart” in 2005). The former Boston University student even managed to mention the city’s favorite quarterback. Q. You’ve committed yourself to Puerto Rico and to supporting its residents in person. What made you decide to get on a plane for that level of involvement? A. I don’t know. I just — I was good at it. Sort of a switch got flipped, and then I couldn’t get out. Like, I just sort of started it, and when you’re good at something and you’re actually helping people you feel this responsibility, and it just sort of took over. I can’t really explain it. Q. It must be overwhelming — assessing the needs of the people there and figuring out how you can make a difference. A. Yeah. It’s like a Third World country. People living in mud and rationing water. It’s insane. Like, it’s a sad state of affairs; it’s really bad. You don’t even know if you’re making a dent, but . . . when we start shipping cargo containers, that will be a major deal. It’s supposed to be the largest private relief effort in history, what we’re working on. I’m ready for my exit strategy, but I’ve got to finish what I started. Q. You talk about private coordination. Can you speak about the efforts of certain elected officials — or the lack thereof — and why private people have felt the need to take this on themselves? A. I can’t because I really don’t know. Like I really, I genuinely don’t know what’s going on. I don’t know, I’m not in those conversations in the government. And so I don’t really get involved in politics and the blame game; I just do what I’m doing. Q. Well, that’s another question. You’ve managed to stay away from the political conversation, at least when it comes to criticism of leadership. Why? A. Because I feel like everyone’s just barking at each other, and yelling at each other, and bullying each other and blaming, and there’s so much anger, and I just feel like, if there’s a mess, you just pick up a broom and start cleaning. It’s like — stop talking. Do something. Q. You’re coming to Boston for a women’s conference, which gives you the opportunity to talk to fans of your television work, your businesses, your philanthropy, etc. What do you get from these speaking engagements? What do you learn? A. It’s connectivity to people; you’re not in front of a camera. Talking to people — the Q and A — is amazing. It’s connection. I love it more than anything. Q. What’s the big piece of advice you like to give? A. I think a good night’s sleep is not to be underestimated. I think laughter is really important. I think you’re not gonna have it all at once. Right now, I haven’t exercised in over a month and I haven’t been sleeping well, but I guess I’ve been helping a territory. So next month maybe I’ll sleep and laugh more, or maybe go on a date or something. Q. You went to Boston University for a few years. What do you think of the city? A. You know, Boston for me, BU for me, it was like — it wasn’t a campus school. So it was very much a city, and I guess I felt like if I was going to be in a city, I might as well just go back to my own city [New York]. Now as an adult when I go back [to Boston], I enjoy it so much more because I feel like in college, I focused on drinking and going out at night, and now it’s like, I see the architecture and the townhouses, and it’s charming and the food is great. A. For Adweek, I was on a panel with interesting business people from the New York Times and advertising agencies. For me, that’s interesting because these are business people, and sometimes I think of myself, even though I know I’m accomplished, as the reality star not to be taken seriously. So I like when I’m on with credible business people. . . . I mean [I was also at an event with] Tony Robbins and Tom Brady, but I [wasn’t] seated with [him], so I don’t get the benefit of [spending time with him]. Q. You didn’t get Tom Brady quality time? A. I did not get Tom Brady quality time. And I don’t like to window shop anyway.